Information for scoliosis patients can be found in the guidebook for patients and their parents, comprehensive information for patients and professionals can be found in the book on Schroth Therapy. So here is the original from the Schroth / Lehnert-Schroth / Weiss family, the only branch that really does develop. Here you can find therapists really trained in the best corrective and most up to date and evidence based methods. Here you can find comfortable braces of highest correction. The whole board of the Schroth Best Practice™ Academy is dedicated to provide the best service for professional trainees. Full training in no more than 5 days, easy to understand, a program initiated by a real specialist (Orthopedic Surgeon, Specialist for Physical Medicine and Rehabilitation, Chiropractor with an examination in Physical Therapy), son of Christa Lehnert-Schroth and Grandson of Katharina Schroth. What you see is what you get (WYSIWYG): Real corrective and easy to apply exercise approach to scoliosis! High corrective exercises derived from the original Schroth concept have been developed for small and moderate curves (15 - 60°) which are proven highly effective. Original Schroth exercises are content of the program as well. 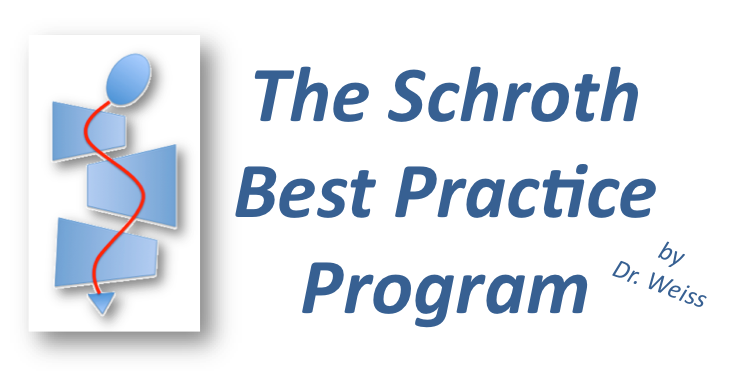 The Schroth Best Practice™ program is the recent development of the original program provided by the Grandson of Katharina Schroth. Schroth Best Practice Program™ by Dr. Weiss is a registered trademark. All materials published on this website are protected by copyright ©. The content of this homepage is regulated and protected by copyright laws. Fraudulent use of the content of this homepage is unlawful and illegal. Furthermore, the use of the content of this homepage violates patient confidentiality laws and HIPPA compliance regulations (in the USA).